Gorgeous. I have not seen this species before. I’d enjoy a description of the set up you have for her and the way you care for her- if its a her or a him. Do you have any personal contact with him/her etc. Thank you! The Avicularia versicolor (Antilles or Montinique Pink toe) is a gorgeous and docile arboreal species that is sought after for its temperament and gorgeous coloration. 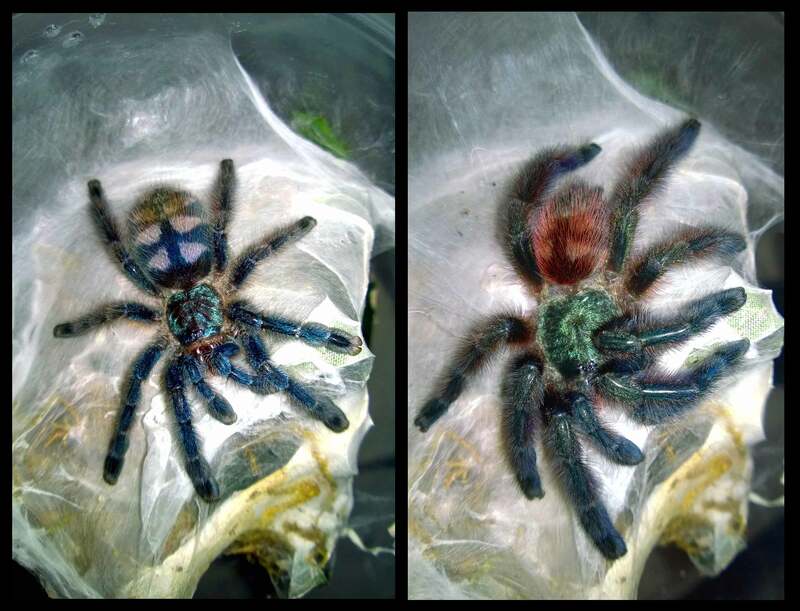 Although they start off as bright blue spiderlings, they morph into adults with greens, purples, and maroons (and they also look “fluffy”, which is quite cute). risks for you, or for hurting her? I was once instructed by ‘an expert’ to be very very gentle when touching the hairs on their back. It made me realize we should probably be pretty careful. Tell us if you decide to touch 🙂 Thanks for sharing. You definitely would want to be careful! They have urticating hairs on their abdomens, which can be VERY irritating. If they get scared or distressed, they can kick these hairs, which dig into your skin like little barbs. This is the main defense of “New World” tarantulas. Oh, this species also shoots feces with amazing accuracy…no joke! I don’t judge anyone who decides to handle, as many people do and without incident. I’ve held two, but only because the little buggers tend to crawl right into my hand every time I open their enclosures. If/when I hold her, I will definitely post!